This piece originally appeared on The Conversation. Read the original article. Experts rate the performance of recent American elections as the worst among two dozen Western democracies. Why? Some longstanding practices are to blame. Partisan gerrymandering insulates incumbents. Infotainment-dominated commercial news reduce campaigns to spectator sport. Social media amplifies angry trolls. Ballot access laws restrict third-party challengers. Women and minority candidates have to fight a hostile cultural backlash. Outdated technologies are vulnerable to Russian cyberhacks. All of these problems have been heightened by the close, heated and bitterly divided 2016 contest. The result: an erosion of American confidence in the electoral process – despite the fact that voter fraud occurs very rarely. In mid-August 2016, Gallup found that only six in 10 Americans are “very” or “fairly” confident that their vote would be accurately cast and counted. That’s down from around three-quarters of all Americans a decade earlier. Among Republicans, the proportion who are confident drops to around half, the lowest level Gallup has ever recorded. Similarly, a Washington Post - ABC News poll of registered voters conducted between Sept. 5 and Sept. 8 found that 46 percent of all Americans believe that voter fraud occurs very or somewhat often, a figure that jumps to 69 percent among Trump supporters. My book “Why Electoral Integrity Matters” demonstrates that any deep erosion of faith in the fundamental electoral rules is cause for serious concern. If the final margin of victory is close on Nov. 8, these perceptions may delegitimize the outcome for sore losers, fuel public protests and exacerbate legal battles. The 2000 Bush versus Gore count in Florida reignited an old battle over ballot access. Since that crisis, Republicans and Democrats have been divided about the most appropriate processes for managing electoral registration and balloting procedures. In the years since, no consensus has emerged about what types of reforms should be prioritized. Debate has been framed as a false trade-off between the rival values of security versus inclusiveness. But there is ample evidence that both are equally desirable and wholly compatible. 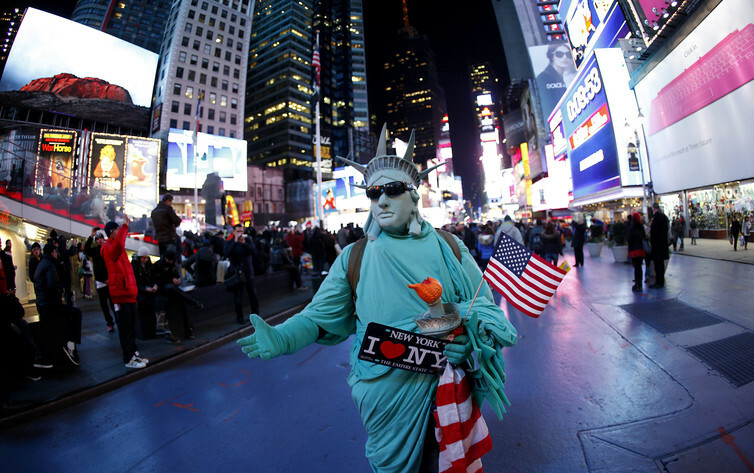 How will Lady Liberty feel about this year’s election results? Over the past three years, Republicans have consistently pushed for more security against voter impersonation. The door reopened in 2013, when the Supreme Court decision in Shelby County v. Holder overturned key provisions of the 1965 Voting Rights Act. This act had required 15 states with a history of discrimination to get the approval of the Justice Department or a federal court before making changes to their voting laws. With this requirement abolished, the adoption of voter ID requirements accelerated rapidly in GOP-dominated state legislatures. By 2016, 32 states had implemented laws requesting or requiring citizens to show some forms of identification at the polls – up from 14 states in 2000. The 2016 Republican platform even urges states to require voters to show proof of citizenship and photo ID. Proponents argue that these steps help prevent the risks of people voting more than once and strengthen public confidence in the integrity of the electoral process. But as the election grows near, many – but not all – of the more restrictive attempts have been struck down by the courts as discriminatory. Donald Trump has argued that these court decisions have increased vulnerability to voter impersonation and multiple voting. Partisan polarization over these issues has been further exacerbated by his repeated claims that the outcome in several battleground states such as Pennsylvania was in danger of being “rigged.” He has now called for volunteers to sign up as observers in polling places. Credible and experienced monitors can help to ensure that procedures are properly followed by making the electoral process more transparent. The danger of untrained and unaccredited partisan poll watchers, however, is that their presence may disrupt poll workers or intimidate voters. In fact, the Republican allegations of pervasive voter impersonation and multiple voting in American elections have been widely discredited. An examination by the Brennan Center for Justice concluded that these problems were largely mythical. The Brennan Center study found just 241 potentially fraudulent ballots out of one billion ballots cast over a 14-year period. Another investigation by News21 for The Washington Post found only 2,068 cases of alleged voter fraud had been reported from 2000 to 2012, including only 10 cases of voter impersonation. Scholars who have examined the evidence thoroughly, including Richard Hanson and Lorraine Minnite of Cornell, have come to similar conclusions. Documented incidents of duplicate voting are sporadic, largely arise from human error and are insufficient in number to sway the outcome of any election. Based on this evidence, Democrats charge that GOP claims of voter impersonation and multiple voting are grossly exaggerated, politically driven and intentionally designed to restrict voters’ rights. Democrats see restrictions as an attempt to disenfranchise populations that move frequently and sectors of the community lacking the necessary official documents. They charge that these restrictions discriminate systematically against minority groups, low-income people, young people and senior citizens. It is also the case that making it harder to register and cast a ballot probably depresses voter turnout, although the effects remain modest. By contrast, Democrats advocate the expansion of convenience voting facilities, designed to boost turnout. They hope that these will reduce the logistical costs facing citizens seeking to register and cast a ballot, and that they will promote full and equal participation. For example, registration via the internet has now become widely available. Thirty-one states are allowing online registration applications in the 2016 elections, although these make up only seven percent of all registration submissions. Thirty-seven states including Minnesota and Massachusetts have relaxed the rules to allow qualified citizens to make use of early and remote balloting, without the need to provide a specific reason, such as disability or travel. As a result of these provisions, voting in person at a local polling station on Election Day has become less common. According to the Electoral Administration and Voting Survey, almost one in four American electors cast their ballot before polling day in 2014. Convenient registration and voting procedures appear to be common sense steps that would serve to strengthen participation in American democracy. Nevertheless, even well-meaning reforms may have unintended consequences. These include heightening security risks, undermining the secrecy of the ballot and producing inconsistent and unequal voting rights across America. Several Republican-held state houses have cited arguments like this as they sought to overturn convenience voting, catalyzing a series of court challenges. For example, in 2013 North Carolina enacted voter ID requirements and simultaneously ended same-day registration, Sunday voting and preregistration for teenagers before they turn 18. In August 2016, the U.S. Supreme Court took up the case, upholding the claim that North Carolina’s voter ID provisions were unconstitutional, although all four Republican-nominated justices on the Supreme Court expressed disagreement. What’s clear is that the debate has treated reforms as a zero-sum trade-off between the desire for inclusive participation and the desire to protect the security of the ballot. In fact, a global perspective shows both these goals can be pursued simultaneously by providing citizens with convenient and secure registration and voting facilities. For example, states could automatically issue all citizens listed on the electoral register with no-cost photo ID cards, as happens in many other countries like India. Taken together, these problems threaten to signify a critical “tipping point” with the capacity to erode public confidence and produce a crisis of legitimacy in the electoral process which would do lasting harm to American democracy. The idea that the losing candidate (and some of their followers) might actually refuse to accept the result for the U.S. presidential election is mind-boggling. Contentious outcomes are relatively common in many places in the world, where disputes can trigger violent protests. But this is America! 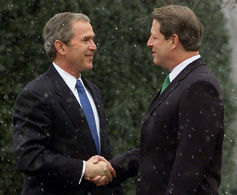 In 2000, despite charges of vote rigging in Florida when George W. Bush’s brother was governor, and after Supreme Court intervention, Gore eventually graciously conceded. Gore ® accepts defeat, 2000. The dangers of a repeat of 2000 are exacerbated by the currently deadlocked composition of the Supreme Court, real threats of cyberhacking by Russia and longstanding Republican claims of voting impersonation, now widely believed by many GOP supporters. What might be done to prevent such a scenario? The courts are the first line of legal defense against charges of election fraud. If electoral rolls were attacked by cyberhackers, or voting machines without a paper trail malfunctioned, however, then it becomes difficult for the courts to establish independent and reliable evidence concerning the validity of the results. The GOP leadership would also have a duty to urge Mr. Trump to accept the will of the people. It would be unacceptable for leading Republicans to stand by passively, or even to endorse any claims of widespread vote rigging. Other sources of evidence could help to provide crosschecks. For example, the declared results in each state can be compared against the results of the network exit poll. After polling day, the Electoral Integrity Project, which I direct, will conduct an independent expert survey with more than 50 questions monitoring the quality of the contest across all 50 states. Other scholars plan to use techniques of electoral forensics to ferret out statistical anomalies in the local results. News reporters and trained electoral observers authorized by international organizations, political parties and civic NGOs can monitor any observable problems occurring in local polling places, such as long lines and excessive wait times. All these independent sources of evidence can help to establish whether there are genuine concerns in American electoral procedures and results – or whether claims are actually cries of wolf by sore losers. To restore confidence in American elections in the long term, however, it is leaders with vision who need to reach across the aisles to implement pragmatic reforms. Otherwise America could be overwhelmed by a fundamental and deeply damaging legitimacy crisis which would be far worse than the events surrounding Bush versus Gore in 2000.